Beatriz at Dinner is a 2017 black comedy-drama film directed by Miguel Arteta from a screenplay by Mike White. It stars Salma Hayek, John Lithgow, Connie Britton, Jay Duplass, Amy Landecker, Chloë Sevigny and David Warshofsky. An American-Canadian co-production, the film had its world premiere at the Sundance Film Festival on January 23, 2017, and was theatrically released in the United States on June 9, 2017, by Roadside Attractions and FilmNation Entertainment, and in Canada on June 16, 2017, by Elevation Pictures. The film opens with Beatriz (Salma Hayek) rowing a boat in a mangrove swamp where she encounters a white goat on the shore. Next, she is shown waking up, taking care of her animals, and heading off to work at a massage therapy center where she meets with her clients. She then drives to the house of an affluent client, Kathy (Connie Britton), to give her a massage before her dinner party. During the massage, Beatriz tells Kathy that her neighbor had killed one of her goats and becomes emotional. Beatriz leaves and heads to her car, but is unable to start it. She tells Kathy that a friend will repair it when he gets out of work. Kathy invites Beatriz to stay for the dinner party. Kathy checks with her husband Grant (David Warshofsky), who objects because they are entertaining important business connections, but he ultimately agrees. The first dinner guests, Shannon (Chloë Sevigny) and Alex (Jay Duplass), arrive, discussing how much money they will make off their business venture. Beatriz explores the house, meets them, and awkwardly introduces herself. Doug Strutt (John Lithgow) and Jeana (Amy Landecker) arrive, and everyone goes outside, where Kathy introduces Beatriz to the other women. She explains how they met: her and Grant's daughter Tara had cancer, and Beatriz helped Tara recover her strength after her medical treatment. Beatriz learns that her friend won't be able to come until morning. Kathy tells her to stay the night and asks her to sing a song after dinner. Back outside, Grant, Alex, and Doug discuss potential titles for Doug's memoir. Doug mistakes Beatriz for one of the house staff and she shyly introduces herself. She tells Doug she thinks she might know or remember him from somewhere. Doug tells her he's famous and she could've seen him anywhere. Evan (John Early) comes outside to get them for dinner. During dinner, Doug talks about the building of his new business, where Alex warns him of potential protestors. Doug laughs it off. Beatriz begins to talk about her life, how she had to emigrate from Mexico when she was young. Doug asks if she came into the country legally. Jeana tells him to knock it off, and lets her finish. As the dinner proceeds, Beatriz leaves to call a family member, asking if Doug was the man they protested back in Mexico. When she returns to the table, she asks Doug if he had a hotel in her hometown; he doesn't recognize the name, but mentions he has other hotels there. Beatriz tells him how the hotel being built promised jobs and opportunities for her community, but ended up destroying it. Kathy invites everyone into the living room for dessert. As the guests make their way to the living room, Beatriz massages Doug's shoulders. The group meets in the living room for dessert, as they are eating, Jeana reveals she and Doug will be going to Africa in the next couple of days, as she is expecting to be bored since Doug will be out all day. The topic changes to Doug discussing how he hunts various animals in Africa, and begins to pass around a picture of the dead animals he hunted to the other guests, once the phone reaches Beatriz, she immediately becomes alarmed and angry and throws the phone at Doug. Doug laughs it off, alongside the rest of the group, saying not everyone can handle the graphic image. She charges out of the room, and Kathy follows, telling everyone she's had an emotional week. Beatriz apologizes and promises to make it up to Kathy. Kathy tells her just to go to bed and stop drinking, since she's had an emotional week. Beatriz heads to Tara's room, where she looks up Doug on the computer, coming across his various controversies and legal problems surrounding his businesses. She then goes back outside to see the guests, performing the song she promised Kathy. She sings a song, and gets into a verbal fight with Doug, upsetting Grant who tells her she needs to leave immediately and he is calling a tow truck to come get her car. Kathy attempts to give Beatriz money, but she declines. Doug follows Beatriz outside, where he tells her no matter what they do, everything is dying. She leaves and gets into the tow truck, then says she has forgotten something inside. Beatriz picks up a letter opener from Grant's office and walks to the foyer, where she sees Doug on the phone. She charges him and stabs him in the throat; however, it proves to be a fantasy. She drops the knife and walks outside, back to the tow truck. As they are driving next to the ocean, she demands the tow truck driver pull over. She descends over rocks to the beach, walks into the ocean and submerges under water, reawakening in her boat on the mangrove swamp of the film's opening, revealing that the opening sequence is actually a reference to the final one where her murdered goat has gone and where she has now "swam" to. In August 2016, Salma Hayek, Connie Britton, John Lithgow, Chloë Sevigny, Jay Duplass, and Nina Arianda joined the cast of the film, with Miguel Arteta directing from a screenplay by Mike White. It was also announced Christine Vachon would produce, under her Killer Films banner, as would Aaron L. Gilbert, under his Bron Studios banner. David Hinjosa, Pamela Koffler also served as producers on the film, alongside Jason Cloth, Richard McConnell, Brad Feinstein and Lewis Hendler, who served as executive producers. It was later revealed Amy Landecker had joined the cast of the film, replacing Arianda. Mark Mothersbaugh composed the film's score. Principal photography began on August 15, 2016 in Los Angeles, California. Production concluded on September 3, 2016. The film had its world premiere at the Sundance Film Festival on January 23, 2017. Shortly after, Roadside Attractions, FilmNation Entertainment and Elevation Pictures acquired U.S. and Canadian distribution rights to the film, respectively. It was theatrically released on June 9, 2017 in the U.S. and June 16, 2017 in Canada. On review aggregator website Rotten Tomatoes, the film has an approval rating of 76%, based on 88 reviews, with a weighted average of 6.5/10. 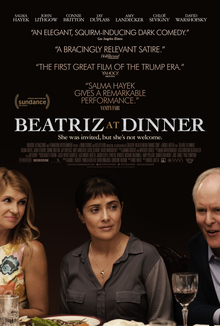 The site's critical consensus reads, "Beatriz at Dinner offers timely social commentary enlivened by powerful, layered performances from Salma Hayek and John Lithgow." On Metacritic, which assigns a normalized rating, the film holds a score of 68 out of 100, based on 36 reviews, indicating "generally favorable reviews". Owen Gleiberman of Variety gave the film a positive review, calling the film a "small-scale but elegantly deft squirmfest that features a luminous performance by Salma Hayek." Eric Kohn of Indiewire.com also gave the film a positive review, writing: "White's script is well crafted as a grim chamber piece, but it falls short of developing its central tension beyond its initial implications." Leslie Felperin of The Hollywood Reporter gave the film a negative review, saying the film is a "flawed work, too broad and scattershot to skewer its deserving targets with the precision necessary for the task." ^ "Printable Film Guide" (PDF). Sundance Film Festival. Retrieved December 13, 2016. ^ "Beatriz at Dinner". Box Office Mojo. Retrieved July 22, 2018. ^ McNary, Dave (August 1, 2016). "Chloe Sevigny, Salma Hayek Join Drama 'Beatriz at Dinner'". Variety. Retrieved August 28, 2016. ^ Jafaar, Ali (August 1, 2016). "Chloe Sevigny, Salma Hayek & Jay Duplass Join 'Beatriz At Dinner'". Deadline Hollywood. Retrieved August 28, 2016. ^ Rama (August 22, 2016). "And So It Begins for BEATRIZ AT DINNER Starring Salma Hayek And John Lithgow". Rama Screen. Retrieved August 28, 2016. ^ Britton, Connie (August 27, 2016). "Shooting a new movie with these lovelys! #beatrizatdinner @salmahayek @chloessevigny @amylandecker". Instagram.com. Retrieved August 28, 2016. ^ "Mark Mothersbaugh Scoring Miguel Arteta's 'Beatriz at Dinner'". FilmMusicReporter. January 10, 2017. Retrieved January 13, 2017. ^ News Desk, Movies (August 22, 2016). "BEATRIZ AT DINNER Starring Salma Hayek & John Lithgow Starts Production". Broadway World. Retrieved August 28, 2016. ^ Walsh, Fiona (August 20, 2016). "Day 5". Instagram.com. Retrieved August 28, 2016. ^ Britton, Connie (September 3, 2016). "Just wrapped "Beatriz at Dinner" with these heroes. Thank you Mike White, Miguel Arteta, amazing crew and this beloved cast. What a dream, and I think the movie might just be magic. Now...Nashville here I come! #BeatrizAtDinner @salmahayek @chloessevigny @amylandecker @bejohnce #JohnLithgow #JayDuplass #MiguelArteta #DavidWarshofsky". Instagram.com. Retrieved September 4, 2016. ^ Patten, Dominic (December 5, 2016). "Sundance 2017: Robert Redford, New Rashida Jones Netflix Series, 'Rebel In The Rye' & More On Premiere, Docu, Midnight & Kids Slates". Deadline Hollywood. Retrieved December 5, 2016. ^ "Beatriz at Dinner". Sundance Film Festival. Retrieved January 23, 2017. ^ Fleming Jr, Mike (January 27, 2017). "Salma Hayek-Starrer 'Beatriz At Dinner' Bought By Roadside, FilmNation". Deadline Hollywood. Retrieved January 27, 2017. ^ "Beatriz at Dinner". Elevation Pictures. Retrieved March 21, 2017. ^ "Beatriz at Dinner". Box Office Mojo. Retrieved March 17, 2017. ^ "Beatriz at Dinner". Retrieved June 2, 2017. ^ "Beatriz at Dinner". Rotten Tomatoes. Retrieved August 12, 2017. ^ "Beatriz at Dinner". Metacritic. Retrieved August 12, 2017. ^ Gleiberman, Owen (January 24, 2017). "Sundance Film Review: 'Beatriz at Dinner'". Variety. Retrieved June 27, 2017. ^ Kohn, Eric (January 25, 2017). "'Beatriz at Dinner' Review: Salma Hayek Assails Trump's America — Sundance 2017". Indiewire. Retrieved June 27, 2017. ^ Felperin, Leslie (January 24, 2017). "'Beatriz at Dinner': Film Review | Sundance 2017". The Hollywood Reporter. Retrieved June 27, 2017. ^ "2017 Award Winners". National Board of Review. May 27, 2017. Retrieved November 29, 2017. ^ Lewis, Hilary (November 21, 2017). "2018 Independent Spirit Award Nominations Revealed". The Hollywood Reporter. Retrieved November 21, 2017.